A NEW STUDY has found that 25 per cent of primary school children are overweight or obese. Over one thousand children in third or fourth class from 27 Cork primary schools took part in the research, which was carried out by the Department of Public Health at UCC. 20 per cent of the children participating were found to be overweight, while a further 5 per cent were classified as obese. 7 per cent of girls were categorised as obese, compared to 4 per cent of boys. The report’s authors said there were clear lifestyle differences between normal weight children and children who were overweight and obese. Over twice as many obese children did no hard activity over a seven-day period, compared to normal weight children. One in five children watched three or more hours of TV, while almost 40 per cent spent at least one hour playing non-active game consoles on a school night. Children who were overweight or obese were more likely to watch TV and play non-active game consoles for longer periods. Overall, nearly ten per cent of children had inadequate sleep levels as reported by their parents. Levels of inadequate sleep were higher in children who were overweight or obese. Five per cent of parents reported that their children never eat breakfast before school, while 15 per cent of parents reported their family eat a take away more than once a week. Almost half of the children had salt intakes above the maximum recommended daily allowance of 5 g/day. Salt intake was significantly higher in children who were overweight or obese. 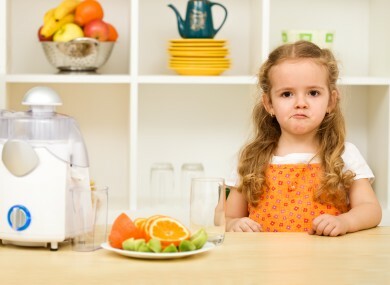 12 per cent of parents reported that their children do not eat fruit, while 13 per cent do not eat vegetables. Additionally, 8 per cent of children who took part in the study were considered as having a high blood pressure. Twice as many overweight or obese children had high blood pressure, when compared to normal weight children. The report’s authors say the findings “highlight areas of action for policymakers, planners and developers with responsibility for addressing childhood lifestyle and wellbeing problems”. Email “One quarter of primary school children overweight (and 12 per cent saying 'no' to fruit)”. Feedback on “One quarter of primary school children overweight (and 12 per cent saying 'no' to fruit)”.